At the very end of the month I turn 35. We’re very short on cash this month, so I’ll be thrilled if I get to go out on a date with my hubby. My love language has more to do with time and acts of service, but what girl doesn’t appreciate a good gift now and then? Here are some things I’d buy for myself if I wasn’t strapped for cash…and such a cheapskate. 1. This by FAR is the number one item on my list. I love this camera (and happen to be the only one of my sisters not to own it). I have a Nikon Coolpix that is over five years old and the battery compartment is held together with duct tape. Yes, it still takes pictures but just imagine the beauty I could capture with this pricey baby. I admittedly drool over it now and then. 2. I have a thing for coats. Perhaps it’s because in Central PA you need to wear one 8 months out of the year. 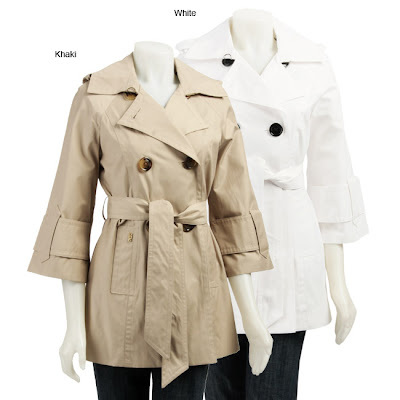 These trench coats from Overstock.com are adorable and great for that awkward spring/fall transition. 3. This is an all-cotton robe from Victorian Trading Company. Isn’t it gorgeous? Silk makes me sweat. (I am a very sweaty girl. More information than you cared to know I’m sure.) So the all-cotton is very appealing. 4. 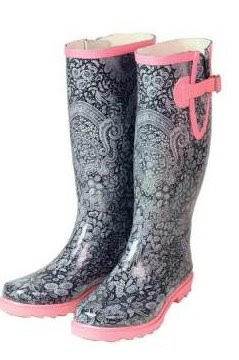 Wellingtons are just the cutest, and I love these black lace and pink ones (also from Victorian Trading Company). Makes me want to go splash in a puddle and sing in the rain. 5. “There’s no place like home; there’s no place like home…” I’m hoping to buy some red heels for myself. These heels cost as much as the camera. Mine will probably come from Payless. But I love the sparkly tribute to Wizard of Oz they’ve got going on here. Beautiful. 5. 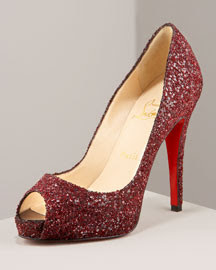 Okay, so I can’t seem to get away from red sparkly things as much as I try. These placemats from Pier 1 would make fantastic pillows…or placemats, but when I saw them I was thinking pillows :). 6. I have loved these footed cooler glasses from Crate and Barrel for 10 years now. Still love them. 7. My big sis just introduced me to this wine. I’ve never tasted it, so I can’t vouch for it’s yummyness, but as a middle sister I love the name. There are several types, but she chose the Drama Queen for me. Drama Queen? Me? Really??? I took the little quiz they offered online just to see what I came out as. Hmmmm. Drama Queen. Go figure. 8. 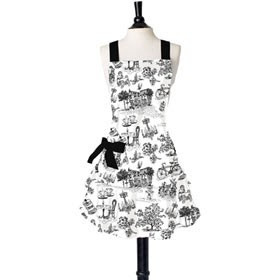 I heart these Jessie Steele aprons! Aren’t they gorgeous? So 50’s and Stepford Wifeish but adorable none-the-less. I’ve never owned an apron, and I think this would make a fantastic first apron to own. 9. 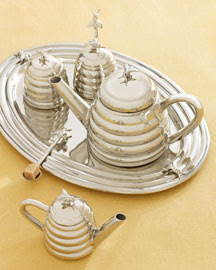 This silver bee tea service from Neiman Marcus is precious. Love it. 10. 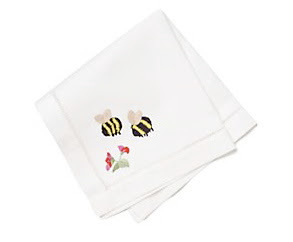 How cute would the tea service be with these little embroidered napkins from Anthropologie? 11. And how cute is um….that chicken? What in the world is going on here??? That poor chicken. That poor girl being attacked by a flower. The fashion world is a strange, strange place. This outfit would NOT be in any wishes of mine. More like a nightmare. I guess the blazer is kind of cute if worn with a real shirt and some real pants. Just seeing if you’re still paying attention…. I think the chicken completes the outfit- that is a great birthday wish list!!! Ooh, I love that stuff! So cute! The robe is to die for. You know, I actually thought that gifts was one of your love language. It isn't? Love the high fashion jab. What the junk are they thinking, anyway? And how do they make a living off of that? Ha, where'd that chicken come from? I've never heard of this Victorian Trading Co, I'm gonna look at their site right now because that robe is gorgeous. It would make my morning cup of coffee so glamorous. I know all about pinching pennies, that's why the majority of my clothes come from The Goodwill (I have so much Banana Republic bought at Goodwill), Target, and TJMaxx. That last picture with the chicken is so funny! I am so glad that you included it! What was that photo shoot coordinator thinking?!? LOL! I hope you get lots of great stuff for your birthday! Poor chicken! Can't believe you don't own an apron! I must be really old, as I have a collection of them. Hope your birthday comes with lots of cool presents!